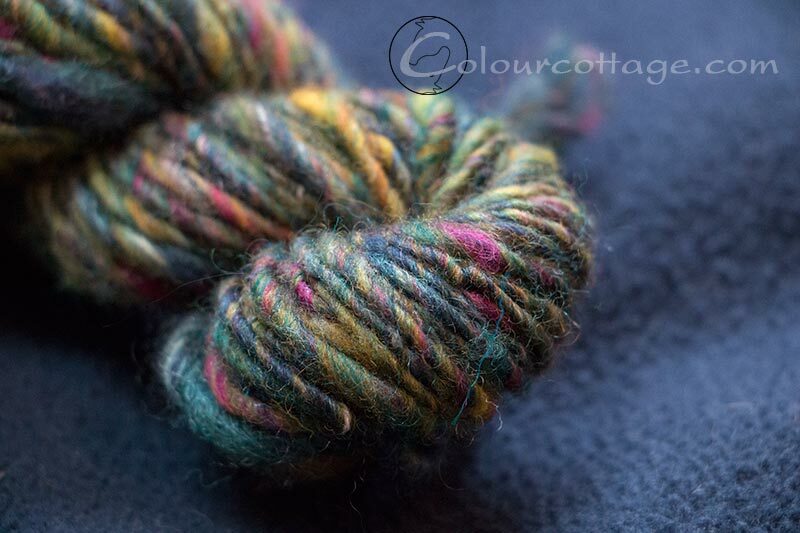 This week I spun one of my silly batts, the one from the fluff box. As I suspected, the really short fibers I carded had a hard time holding together as yarn. I could have spun it slowly and carefully, after all cotton can be spun. But I wanted a robust looking fluffy yarn, not a high twist rope, so I decided to try and spin it with a stronger core. Not actual corespinning, where you paint the fiber onto a thread by holding the two at a 90 degree angle, I just ran the thread along in my fiber supply while drafting. I tried to take a couple of pix of how I hold the fiber in my right hand, then I do a short forward draw with my left basically pulling at the thread and letting the roving run loosely inside my palm around the thread. 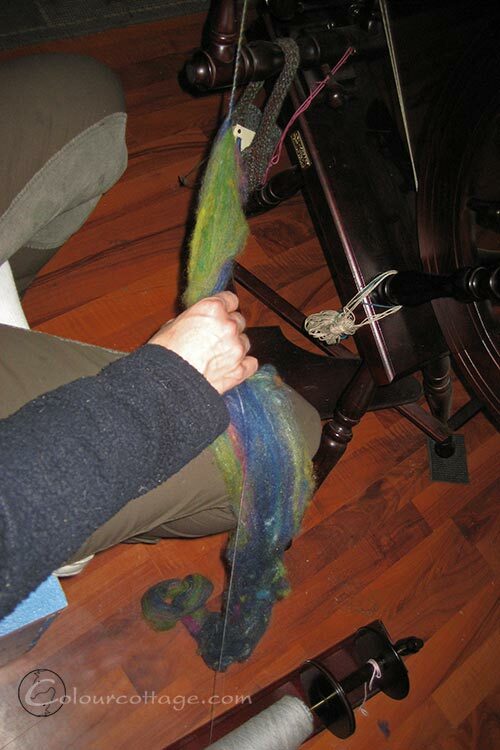 When I spindle spin I draft and suspend the spindle with my right, but since the orifice on the wheel is to the left I felt it was more convenient to switch. It didn’t really take a lot of time to get used to, so now I can do both. 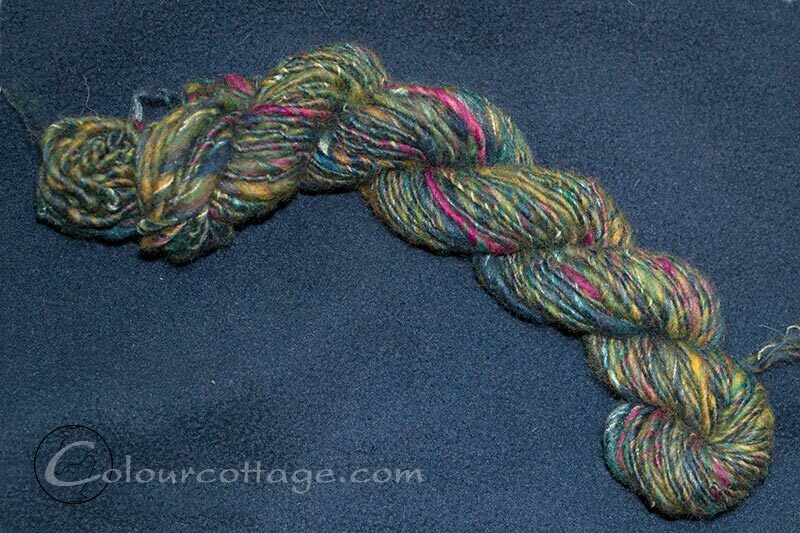 I’m keeping it as a single as planned, since the colours were mingled quite well enough on the carder already. And the thread simply keeps the fibers from drifting apart. Yes, I know that I’m spinning in my riding breeches, I just can’t be having with changing my outfit 5 times a day. I also did not sweep the floor for the photo shoot. I really think there ought to be staff for such things – or is that children? This is a technique I will have to try. It looks like you have been having fun with your carder. Yes, I think it’s going to be a great asset! Tak, jeg kan godt lide det lidt rustikt en gang imellem. 🙂 Tænker det kunne være kant eller accent på noget ensfarvet et sted? Thank you for explaining your technique and providing beautiful pictures. Your handspun yarn is beautiful. Impressive. Lovely colour combination. 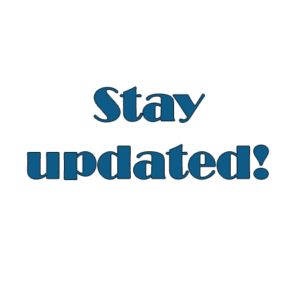 Having staff is a good idea, so that you can get on with the good things in life! Wow, thanks! Makes me happy when someone enjoys my scribbles. I suppose you’re right about the kids making more of a mess than cleaning one. I like the results very much. Lots of interest there; thicks and thins and the colours blending are gorgeous. 😀 I like it a bit structured sometimes. I’ll find some place where it can be an edge to some solid colour I think? Yes that would work. I’ve never knitted with singles before. Do they hold their twist? Yes, once the yarn is washed they hold their twist just as well as a plied yarn. Great, thank you. I’m going to try that. Well, I noticed afterwards they were looking a bit mucky 😉 even though I haven’t actually gone riding in them. And in some of the photos (not these) I noticed all the fluff on the floor and thought some might get an attack of cleaning OCD from seeing my house, LOL.